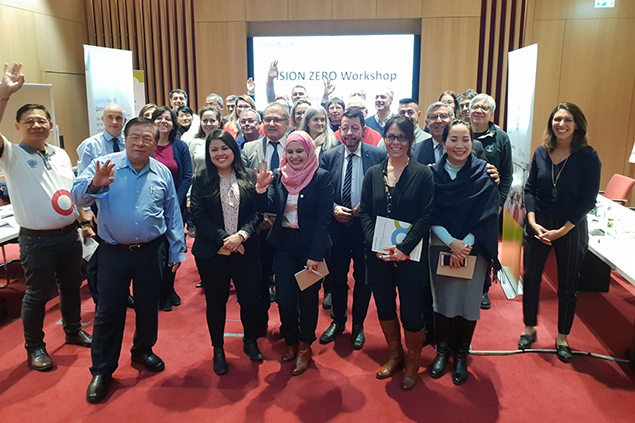 The workshop, which was organized by the ISSA International Sections on Construction and Mining in cooperation with the DGUV and the ISSA Secretariat, focussed on the 7 Golden Rules and how to use them effectively to in Vision Zero trainings. While building on the training material provided by the campaign, participants also shared their own material, approaches and experiences in order to learn from each other. A number of good practices on safety, health and well-being at work were identified and discussed. One of the key conclusions was that the Vision Zero is a great platform for employers and employees to work collaboratively towards a safe and healthy workplace, and could replace or supplement more traditional and conservative approaches to OSH management. Among key speakers during the workshop were Karl-Heinz Noetel, President of the International Section of the ISSA on Prevention in the Construction Industry, and Helmut Ehnes, Secretary General of the International Section of the ISSA on Prevention in the Mining Industry.